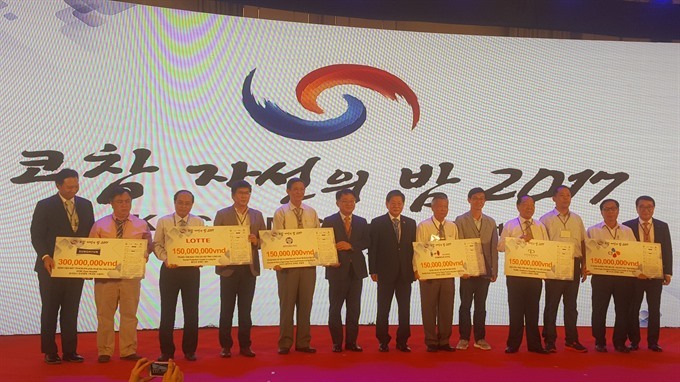 HCM CITY - Some VNĐ4.64 billion (US$206,000) was collected by the Korea Chamber of Commerce & Industry HCM City at the 14th KOCHAM Charity Night, organised on Friday in HCM City. Some 130 South Korean enterprises contributed VNĐ4 billion in cash and VNĐ600 million in gifts for charity. The money was donated for the HCM City Children’s Disability Association; the Orphanage, Disabled Children Care Centre in Đồng Nai Province; the Association of Victims of Agent Orange/Dioxin Social Protection in Bà Rịa – Vũng Tàu province; the Orphanage and Poor Patients Protection Association in Bình Dương Province; the Social Protection Centre in Long An Province; the HCM City Eyes Hospital; the Patient Support Fund; the Thiên Phước Disability Facility in district 4, the Korean Elder Citizen Association in Việt Nam; and the Korean Support Fund. KOCHAM HCMC has been in operation since 2003 with 700 enterprises, which represents the 2,500 Korean companies operating in the South and Central region of Việt Nam. KOCHAM HCMC has organized the annual KOCHAM Charity Night since 2004. This year, Việt Nam and South Korea celebrate their 25th anniversary of diplomatic relations.